Book Review: 'The Volunteer,' By Salvatore Scibona Salvatore Scibona's new novel is a generational saga, an epic of Vietnam and other places rendered in language that makes even simple things sound mythic. But first, a boy is abandoned at an airport. 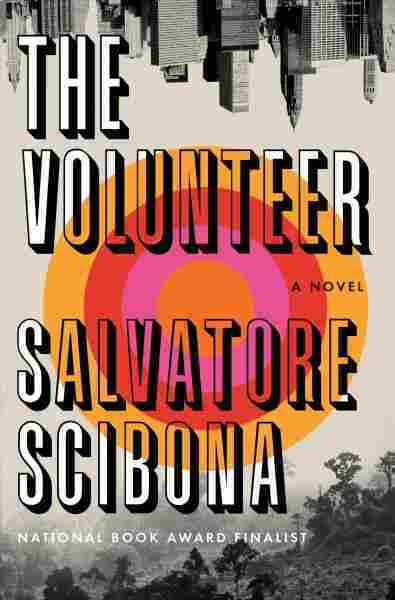 This is The Volunteer, the new novel from Salvatore Scibona. It is a war story unlike any other war story, a story of fathers and sons, of family (both biological and manufactured) and of generations of betrayal and abandonment. It takes a single thesis, argued a billion times before — that some sins are hereditary, passed down from men to their sons who are doomed to repeat them — and argues it across hundreds of pages. Sound dull? You're wrong. Tired and worn-out? Not even a little. Not here, in Scibona's hands, where the simplest things (nature, pride, a white t-shirt, the taste of water from one's home place) become mythic and strange, almost magical, imbued with meanings beyond the plain fact of their existence. And the tracers came rocketing out of the barrel hot and red like wishes that seemed to slow as they sailed farther away, tracers that sometimes took a sharp upward or outward turn like wishes gone wrong when the tracer hit a rock or helmet or another bullet amid the profusion of rounds five times as numerous as were visible, and ricocheted. The Volunteer begins with the boy, then shows us the father of the boy in his slinking cowardice, in the midst of his terrible decision (explaining his action only with "It didn't work out, you know? "), then comes unfixed in time. It flashes back to the 1960s where an underage boy, Vollie Frade, forges his father's letterless signature onto paperwork and joins the Marines. He does a tour in Vietnam as a convoy driver, sees Khe Sanh, lives. Does another, lives. Does a third and is stationed (illegally, in contravention of international agreements) in Cambodia, guarding an ammo dump, where he is captured by the NVA and held prisoner until his release is bought by a mysterious quasi-governmental agency represented by a man named Lorch who wants Vollie to do a job for him. The story spirals from there, sliding from Queens and the covert world to a New Mexico commune where Vollie finds a girl and a child named Elroy Heflin to call his own, to Germany and Latvia and Afghanistan (later) with Elroy, through cycles of violence and loss and remorse. And all of it — all of it — is just so ridiculously beautiful. So bright and sharp, as though Scibona is able to hold even the most mundane of human moments perfectly in his head, see them from every angle, sniff out the waves of cause and effect that radiate from them. He does this over and over, giving "mythy" weight to the smell of burning piñon wood or the icy cold of river water or the light on a Saigon street, repeating them like mantras throughout, returning to these images like reliquaries of awful, beautiful memory — the elements that form the soul of a man. The Volunteer actually walks the edge of magical realism. Not deliberately, I don't think; not through any design of the plot or minds of its characters (because these are pragmatists Scibona offers us, each of them pared down to the bone by tragedy and seemingly inescapable destiny). But the way Scibona writes, there are few moments that don't feel enlivened with something ... more. Something extra. Some secret power of history, family or fate thrumming away unseen behind the curtains of the world, driving events. Some force that everyone who's paying attention can sense but not see, that drives a chain of bad decisions and selfish acts that echo down through generations of families. And between all that — in the moments where the world is just the world and the people in it are no more or less than anyone else — there is still this pitch-perfect dialogue, this joy of language and description, this tension between the inner world and the outer that makes every page hum. Scibona is a remarkable writer and The Volunteer is a remarkable book. Not just for fans of war stories or family stories or generational epics or tales of children lost in airports, but for anyone who loves words and the way they fit together — the way 10 of them can set a scene and 100 can sketch a life. Heavy as it is, there's a buoyancy to its voices that makes it compulsively readable, a dogged survival instinct that makes even its darkest moments bearable. The characters get under your skin. They climb into your head and live there long after you close the covers, and you will take their joys and miseries to bed with you for a long time after.